Autumn is upon us and the Carnival Kickstarter campaign is behind us, but suddenly we’re busier than we’ve been in quite some time here at Dice Hate Me HQ! Monkey238 is eyeball deep in studies for her final semester of schooling and I’m wrapping up graphic design duties on Clever Mojo Games’ successful Kickstarter venture, Sunrise City. So, we’re taking a week off to catch our breaths before we unleash some of the best content of the year here on the site – and here’s a brief peek at what we have in store before we ring in the new year! We’ve received a whole stack of cool titles, perfectly filling up our table and waiting for their place on our new game shelves once they’ve been taken for a spin. Tasty Minstrel Games has been busy! We’ll be taking a look at no less than five titles from the TMG crew this fall. 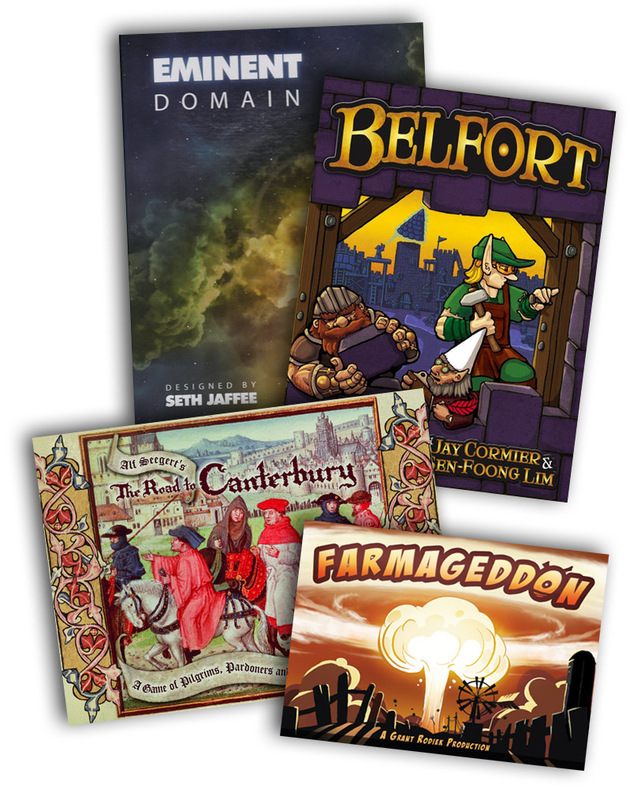 We’ll give you our thoughts on Belfort (tiny spoiler: bring your A-game and your second brain), the highly-anticipated deck-builder Eminent Domain, the second edition of Homesteaders (it’s pretty), Jab: Realtime Boxing (finally!) and a preview of the prototype for Kings of Air & Steam (zeppelins and trains!). More prototypes! We’ve been receiving a healthy heaping of cool prototypes from designers looking to get opinions and maybe a little coverage. Four of the most notable are Space Shipping (shipping things… in space!) from Joe Hopkins, Compounded by Darrell Louder, and The Market and Three-Squared from Ben Rosset, who we met at the WBC. I won’t spoil everything, but I will say that they’re all pretty darn cool – and it wouldn’t surprise me to see them in print before too long. Our recent team-up with Tom Gurganus of Go Forth and Game should bring you all some quality interviews before too long. Tom has some probing questions all set for John Clowdus of Small Box Games fame, as well as a look at a couple of other small publishers: Gozer Games and IcePack Games. I’m hoping to catch up with Donald X. Vaccarino after Essen to talk more about Kingdom Builder and Nefarious, and I’ll definitely be catching up with some local talent at the MACE Convention in November, including a convention wrap-up. It’s not just a gaming convention this year – it’s also a bachelor party. Release the Kraken! Monkey238 and I have a lot in store for you with The State of Games in the next couple of months, including a special Halloween episode – on Halloween! In that episode, we’ll be discussing our favorite games for Easter. Or maybe horror games, which might work better. In future episodes, we hope to take a closer look at gaming in public, including the introduction of a new segment that will be hilariously successful or an epic failure. Either way, it will make for a great show! The next three months are going to be filled to the brim with options galore for your favorite gamer, and we hope to help you out on Black Friday with our annual Holiday Gift Guide. This time, you’ll get two opinions for the price of one, as Monkey238 will give you some cool titles that’ll rock the worlds of the female gamers on your nice list – and maybe a couple for the naughty ones. 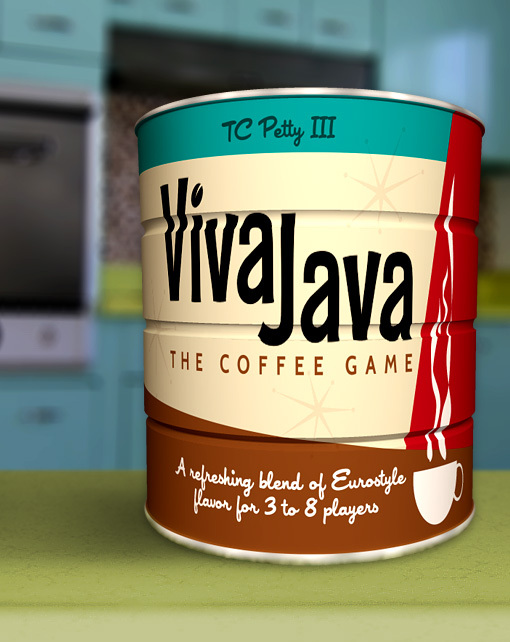 Finally, we promise to bring you some sneak peeks at the development of the next release from Dice Hate Me Games – VivaJava: The Coffee Game. We’re in the final playtesting phase right now, with art production set to gear up in a couple of weeks. The plan is a release at Origins 2012 – but there’s a lot of work to do before then! In addition to VivaJava, Carnival is being born as I type this, and the next three months should see it make its way from the printer to Kickstarter backers’ hands, and finally to the shelves of quality game stores that are (hopefully) near you. So that’s what’s in store here on Dice Hate Me; be sure to check back next Monday for the kickoff with the next The State of Games podcast. And be sure to let us know what you’d like for us to take a look at – we may have a long list, but there’s always room for all your ideas. Happy Gaming! Whew! I’m exhausted just reading all that! Keep up the good work! I have a lot of reviews and yes interviews on the way. In addition to John Clowdus I will be talking to Seth Jaffee, designer of Eminent Domain and chief game developer for Tasty Minstrel, about the ins and outs of designing games. I also received games from TMG – Belfort (excellent thinky game), JAB (a very surprisingly fun game), my Kickstarter of Eminent Domain (happy to have the real game in hand), and Martian Dice (a fun filler). So I have my own thoughts to give on these. I also have reviews of If I’m Going Down…, a new zombie game with a twist from Van Ryder Games. And another prototype from Bellwether that we are taking a look at right now. I too will be attending MACE and perhaps an interview or two will happen as a result. My top 10 of the year is in the works too. Wow! I’d better get busy!